(Phys.org) —Astronomers have collectively puzzled over two working theories for a conundrum involving the sun that have been discussed in Astronomy 101 classes for decades: Why is the sun's corona (the atmosphere beyond the sun) so hot? The sun's core is a searing 15 million degrees Kelvin, but by the time that heat reaches the sun's surface, it cools off to a mere 6,000 degrees, only to again heat up to more than a million degrees in the corona. Two researchers at Columbia University recently published what they believe is the solution, and it has to do with magnetic waves known as Alfven waves. The researchers present their findings today at the Hinode 7 Science Meeting in Japan. The coronal heating problem has been debated for 70 years with researchers essentially falling into two camps: one involving the Alfven waves and the other attributing the heating "problem" to magnetic field loops that stretch across the solar surface with the potential to "snap" and release energy. The important key to Hahn and Savin's findings comes with Hinode satellite observations. The team has been studying Hinode data since 2009 with funding since 2011 from the NSF Solar, Heliospheric and INterplanetary Environment (SHINE) Program. In fact, technology had to catch up to theory to make this happen. The Hinode satellite, a Japanese mission with the Extreme Ultraviolet Imaging Spectrometer developed as collaboration between Japan, the United Kingdom and the United States, offered unique, previously unattainable observations. While the sun is almost 93 million miles from earth, the electrons and protons from the sun move toward Earth via a wind of particles. This solar wind has impacts on the Earth's atmosphere in locations where satellites provide important imagery of our planet and allow technology like GPS and cell phones to operate. "Ultimately, this kind of research does provide new perspective on space weather, which is known to affect the Earth" said Hahn, who was awarded a 2012 Blavatnik Award for Young Scientists by the New York Academy of Sciences for his work on the coronal heating problem. "Understanding these fundamental processes improves our understanding, of not just the solar corona, but also of space weather." Specifically, the high temperature of the sun's corona causes it to emit X-rays that can affect the conditions of Earth's atmosphere where satellites roam. "The sun is the biggest X-ray machine in the solar system," Roussev explained. "The upper layers of earth's atmosphere absorb those X-rays, but what they do is heat that upper atmosphere. It expands almost like the Earth breathing in and out. This has a direct impact on the lifetime of satellites. The more the atmosphere expands, the slower the satellites move. That shortens their lifetime as they slow to a point where they re-enter the atmosphere." A field line cannot snap. It is a nonphysical entity, comprising the calculation or measurement of a field value along a path. It is by definition smooth and continuously differentiable, which means it cannot have a discontinuity. If a field line pulsates it is because there is an amplitude pulsation of something physical, like matter density. A field line cannot snap. When the field along a (former) field line reaches zero and the gradients diverge shortly afterwards the line has effectively 'snapped' into two (or more). If the gradient doesn't diverge it may just have reversed direction. But not necessarily monotonous. See above. There is no discontinuity needed for a field line to 'snap'. I certainly do not know if this is a reasonable explanation, but since the sun's corona is a plasma it should be able to absorb the higher frequencies, such as x-rays and gamma rays, radiated from the sun's surface. This could be the source of the extremely high temperatures of the corona. The corona may be shielding the earth from most of the sun's harmful high frequency radiation by absorbing it. There is either a magnetic field or not, there is no "field line" in any way shape or form. We humans are pretty stupid, so to "visualize" this invisible field at a given time or place we use mathematics and draw lines to help. Some have chosen to reify these mathematical constructs into real entities, completely ignoring Alfven and others for decades. Note in that comment; "If the current system changes". Alfven understood electricity is the cause of the magnetic field, if you read above there is no mention of currents. Just magnetic loops, snapping field lines, x-rays caused by heat, and any number of other misrepresentations of plasma phenomena. We all can see what's going on here. Your derision of a mathematical tool is rooted in deep shame stemming from your mathematical illiteracy. My derision is directed toward those who can't see the difference between a tool and what is real. It's rather apparent there is a tool present though. Looks more like the confidence is in interpretations of observations and there is the hope others will concur with those interpretations. Among the many types of structures on the surface, those at the poles are quite unique, certainly with regard to observations of A-waves at all, much less addressing conditions conducive to their formation. It's hard to believe there's any heating of the corona whatsoever by A-waves propagating through a hole in it. It'll take you the better part of an evening to garner all the information contained in the following link. It is a very well researched paper on just this subject, and references data from many sources, like SOHO and TRACE. There are a whole host of unexplained phenomena related to the sun's activities that still baffle gas model theorists to this day because they fail to recognize the existence of an iron alloy transitional layer that rests beneath the visible photosphere. 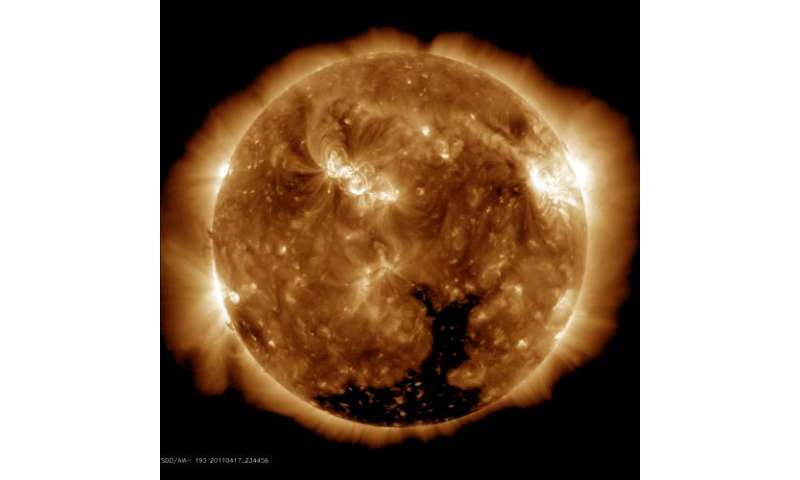 Fortunately a host of new satellites and the field of heliosiesmology are starting to shed new light on this mysterious "stratification subsurface" layer of the sun that is located about 4800km beneath the visible photosphere. It'll take you the better part of an evening to garner all the information contained in the following link. Took only three minutes to read it. But maybe I'm especially talented in the reading department. Nothing in it was compelling in the least. But if ya like it, carry on with it. Ya are the best judge of the use of your time. Q-Star: you didn't read all of the site's content. Like I said, it would take you the better part of an evening to garner all of the information contained therein. If you don't take that data seriously, because it comes form the instruments sent up there to examine and analyze the sun, then we can all cease to take you seriously. I don't care how ya take me. It took me only a few minutes to read the article. At the bottom it had a link for Contact For Further Information,,, it was for emailing the author. I didn't find that he has a site to peruse, just the one article ya linked to, unsigned I might add. I did not find his arguments compelling. I can site hundreds of books and papers and apply them out of context to promote my theory of the unicorn. But that doesn't mean any of the authors of the papers endorses my theory of unicorn. Maybe ya could get can'tdrive or HannesAlfven interested, they think all theories are created equal and every world view is correct. As should all your comments troll. And yet you have managed to get at least 12 accounts banned from this site. My next pick would be the ratings troll, Noumenon, and his 50 sockpuppets. He's the one who is always complaining about ratings trolls? Hmm, maybe so, but the HannesAlfven nutter is so very tiresome with his endless streams of "unoriginal" rants against unoriginal scientists. I don't think he has ever spoken in his own words, just snip and glue from the same four or five disgruntled people. He's mostly just mad because no one would acknowledge his genius and wouldn't help him in his delusions of greatness. In other words, he couldn't cut it in a science program. So now he annoys for payback and to get even. He doesn't believe all that silly stuff he posts, he uses it as a weapon. You are quite right about HannesAlfven and his minion cantthink85. Noumenon doesn't like other people exercising their right to vote on people's posts. So he has at least 50 sockpuppet accounts purely for upvoting himself. He usually only does this on older threads in the belief that noone will catch him at it. He has occasionally used his sockpuppet army to downvote posters, such as FrankHerbert. The fact that members such as toot chose to interact with the voting button rather than posting doesn't make them a "ratings troll", unnless they have multiple accounts for this purpose - as does Noumenon.